How to Rip DVD The Dark Knight Rises to iPad with a DVD to iPad Ripper? The Dark Knight is back! The finale of the Batman trilogy - The Dark Knight Rises tops the box office for THREE straight weeks in the cinema. Though The Dark Knight Rises DVD still not released, it has already been a hot topic among young people. What's the IN trend to enjoy The Dark Knight Rises? If you take your side for watching the ripped The Dark Knight Rises DVD on an iPad, I'm in. We all can't refuse the appealing features of iPad like big screen, long battery life, and the most important, convenience of carrying along. 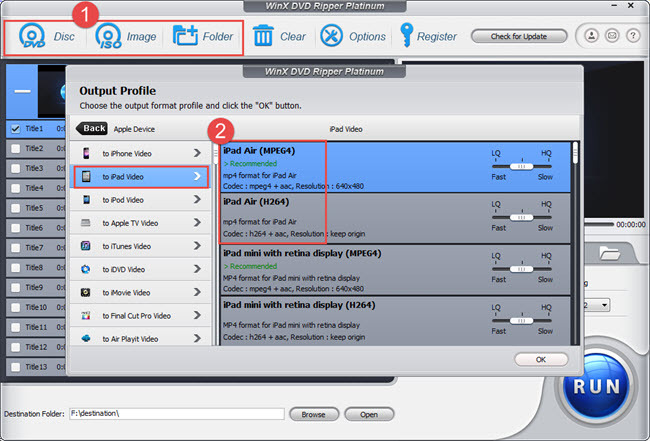 Besides, ripping DVD to iPad is no longer a big deal today thanks to the developing of DVD to iPad ripping software, like WinX DVD Ripper Platinum. WinX DVD Ripper Platinum is a powerful DVD ripper that supports ripping DVD The Dark Knight Rises to iPad (the iPad 2/3/4, iPad Pro, iPad mini 3/4/5, iPad Air 2/3), iPhone (iPhone 6/6S), iPod, Apple TV, Android phone/Tablet, PSP, etc. Besides, it's able to remove general DVD encryption like CSS, Region Code, RCE, UOP, etc. What's more, the publisher (Digiarty Software, Inc.) keeps upgrading it to support the latest DVD encryption, like Sony ArccOS, Disney x-project DRM, etc. How to Rip DVD The Dark Knight Rises to iPad with DVD Ripper Platinum? Free download here to give this DVD ripper a try. Step 1: Run this DVD to iPad ripper on your PC. Import DVD The Dark Knight Rises through "DVD Disc" button. FYI, WinX DVD Ripper Platinum will automatically skip ads and select the main movie title for you. Step 2: Select "to iPad" in the middle column as the output device. This DVD to iPad ripper has been preset with several recommended iPad profiles. It's really time and effort saving if you're no techie. Step 3: Set a destination to store the ripped DVD The Dark Knight Rises. You can "Browse" or "Open" your local folder to select a path. Step 4: "RUN" to rip DVD The Dark Knight Rises to iPad. It delivers stunning fast speed and flawless output quality. Finally, you need to transfer the ripped DVD movie to iPad via iTunes. Then, you can watch The Dark Knight Rises on iPad anywhere, any time. That's the IN trend.